Restricted Air Flow? Check Your Air Conditioner's Duct Work! Restricted Air Flow? Check Your Air Conditioner’s Duct Work! Home → HVAC Blog → Restricted Air Flow? Check Your Air Conditioner’s Duct Work! Just as a highway becomes blocked by an unfortunate accident, your home or office air conditioning system might be hindered by restricted air flow. A potential culprit of restricted air flow could be the system’s duct work. Your home or office duct work can become crimped, develop leaks, or become congested with debris. Raccoons, rodents, possums and other animals have been known to make homes in air conditioning duct work. All of these issues mentioned make your system work harder and increase the cost of utilities each month. Regardless of the age of your HVAC system, restricted air flow has the potential to be a problem. It is a frequent issue in older homes, remodeled homes, as well as in reconfigured offices. Even in newly constructed buildings duct work can cause trouble for your air conditioning system. 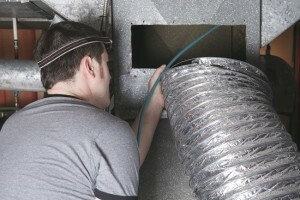 The duct system may be improperly installed, or may have sustained damage after the installation and inspection. Quickly troubleshoot with these tips to determine if you can resolve issues with restricted air flow. Vacuum vent covers to remove debris and dust. Replace damaged, blocked, or partially blocked vent covers. Open all interior doors; do not close off unused rooms. If you continue to experience issues after taking these steps contact us! At Texas Air Tech, we want to help make sure your HVAC system is working properly.